I am quite happy to report that we have identified our second Fedora Design Bounty Ninja: Emily Dirsh!! Emily responded to our second Fedora Design Bi-Weekly Bounty – a slide template project – shortly after introducing herself on the Design Team’s mailing list. 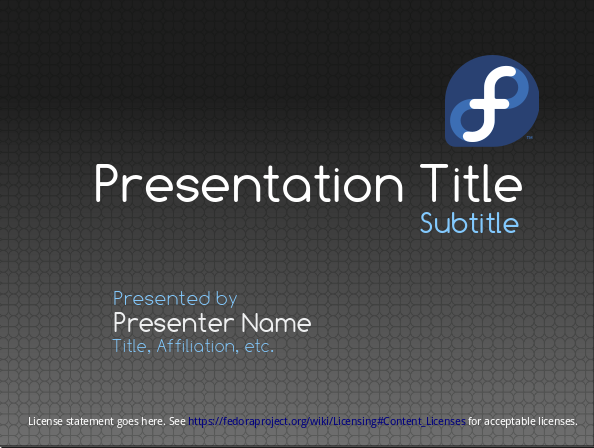 Emily put together a new default slide template for Fedora presentations, using Inkscape to create her mockups, and building the final template for OpenOffice.org Impress. She came up with a very nice texture for the background based on Fedora logo elements, and carefully adhered to all of the Fedora branding guidelines. She also provided all of her source work! Congratulations, Emily, on a job well-done! Emily has already started regularly attending the Fedora Design Team meetings and has provided very useful suggestions during these meetings, including some great feedback on Fedora websites redesign project, so we’re definitely looking forward to work with her more! Both Emily and Jef have ninja supply kits on the way to help thank them for their Fedora Design Bounty work. Are you ready for your chance to become an open source design ninja too? 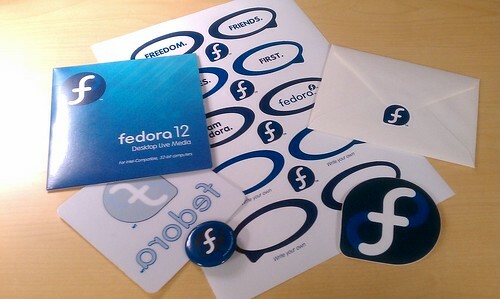 Keep an eye out for the next Fedora Design Bounty! Thanks, Máirín! And thanks to everyone on the mailing list for all the helpful suggestions. I got my swag today in the mail! Very exciting! Although my cats weren’t happy about me trying to put fedora stickers on them! (Just kidding! no cats were harmed/annoyed) I’ll try very hard not to abuse my newly-earned ninja powers! 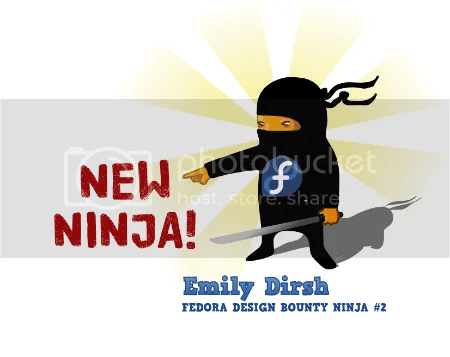 Wow, thank you Emily for this great template and your new Ninja title! I will sure use it at my next Fedora related presentation.